so maybe my dream of getting exciting people in the silicon desert really starting to think different is coming to fruition? this past weekend was PodCampAZ, an event organized by some community members, sponsored by a few organizations and attended by many. the primary face of the event seemed to be brent of iboughtamac.com. let me tell you, if anything else brent seems to have solid skills as an organizer, designer, and marketer (i'm amazed at how he's marketed the iboughtamac brand -- how do i get a shirt?). the site for podcampaz was very cleanly designed and wasn't thrown together (or at least didn't appear that way). kudos to brent (and anyone else who helped) for that effort. UAT was again the host for a community event and i'm liking this trend A LOT for them. UAT has really, really stepped up to support these community events starting with Desert Code Camp and then BarCamp (note: another BarCampPhoenix will be happening on 08-DEC) and now PodCampAZ! for an institution to recognize the value of having such things is great and i applaud UAT and all the staff that make these things happen (thanks Meredith!). I wasn't able to stay long at podcampaz because my wife was in a triathlon and i had full-time mr. mom duty with a 1 year old and 5 year old (small children + geeks + no dora != fun). i did manage to stop by and drop off some stuff to brent for giveaways for the ending session (i dropped of a zune, some copies of vista/office/windows server, and a lifechat headset). i stayed for a few minutes and walked around. 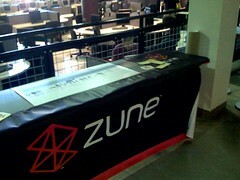 surprisingly there was a zune table (apparently they were a sponsor but didn't donate a zune themselves :-)). they had the banner and some stickers so i grabbed a few as the laptop lid is a little bare these days. whomever was able to reach out to the zune team, kudos -- i don't even know how to get them to answer my calls. hopefully they kicked in more than stickers :-). there was a flurry of podcast-type sponsors. techsmith and their supremely awesome camtasia studio and snagit products were being demonstrated in the foyer by bruce jacobs (done very well, i might add). bruce was also talking about jinq, a very cool mini-screencaster i know betsy weber was there but didn't get a chance to catch up. 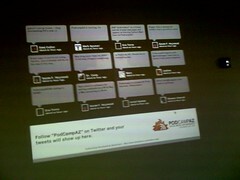 they had the twittercamp application running on the wall so you could get your twitter fixes while walking to the next sessions. the sessions themselves seemed really broad as well. there was plenty to listen about core podcasting itself (audio basics, equipment, screencasting tools, etc.) but there were also discussions about social media and how to integrate better with other platforms. securely delivering media content was another topic and also one of the sponsors preeso had information about their secure and subscription delivery mechanisms. one of the interesting sessions i saw on the agenda was leveraging social media and podcasting in the classroom. there was an instructor there talking about how he'd begun to use the concept of podcasting to get his lecture content our, streamline learning for students and just overall be more efficient using platforms that were available to him (i cought some of this on the live ustream.tv feed). there were also some big name bloggers there as well. 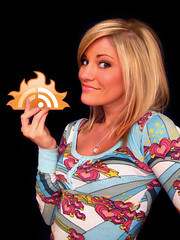 the internet herself, iJustine, was there in full force. rumor has it that ask-a-ninja himself was there. it seemed like a really good time with some energy. i have no idea how many people were there (it didn't look like the scale of a typical code camp). brent was running around a lot (i only got to introduce myself a bit to him -- call me, i'll buy lunch) and there was a host of volunteers doing all sorts of things. the event was very well put together. i wish that i had been able to stay the entire day. i also wish that i would have seen this marketed in some of the other broader user groups in phoenix area. it didn't hit some of the groups like refresh until only a week or so out. i think next time around it will have bigger traction from simple awareness. until then, great, great job brent and team. looked very well done and i love to see the commitment to community in our area. keep up the great work and i hope that the contributions microsoft was able to make to the event prizes were met with few boos :-). this event reminds me that there is usually something in the community happening EVERY day if you are looking for it. speaking of which, remember facebook developers garage is coming!